Cigar Review: E.P. Carrillo Interlude Maduro Rothschild Jr.
Baby, it’s cold outside. For those of us not lucky enough to live in a tropical climate, February–with its diminishing humidity and freezing temperatures–is a stark reminder that winter is not the most accommodating season for cigars. This may be the shortest month in terms of days but, here in Chicago, it certainly feels like the longest. While braving inclement weather shows a true dedication to the leaf, Jack Frost does everything he can to make standing still or sitting down pretty damn intolerable. That’s why many cold-climate cigar enthusiasts turn to smaller, shorter cigars this time of year. If you’re looking to pack a premium cigar experience into a short amount of time, cigar legend Ernesto Perez-Carrillo has your back. In 2016, he launched Interlude, a line of two different blends each presented in two winter friendly formats: Carrillitos (4 x 38) and Rothschild Jr. (3.75 x 48). I smoked a handful of cigars in the Interlude Maduro Rothschild Jr. format for this review. This cigar is neatly presented in a regal, compact five-pack that retails for $16.25 (or $3.25 per cigar). Once the cellophane is removed, the rustic, highly mottled wrapper comes into view. It is wrinkled, veiny, and rough around the edges—especially at the seams and cap (this is, to some extent, to be expected with San Andrés wrapper leaf). The feel is firm. Still, after a guillotine cut, the cold draw is smooth. At the foot, I find pre-light notes of leather, green raisin, and caramel. The introductory flavor is a full-bodied experience with plenty of black pepper spice, rich molasses, and black coffee. Quickly, the Maduro Rothschild Jr. settles into the medium- to full-bodied spectrum. As the body and spice settle a bit, the introduction of café au lait with sugar adds sweetness, creaminess, and balance. At the midway point, a salty peanut flavor joins the fray. This is about how the cigar remains for the rest of the 45-minute smoke. Throughout, construction is flawless. The burn is straight from light to nub, the ash holds well off the foot, and the draw is clear. Notably, the smoke production is well above average—especially for a cigar that feels this firm. I am looking forward to trying the remaining three Interlude cigars. The E.P. 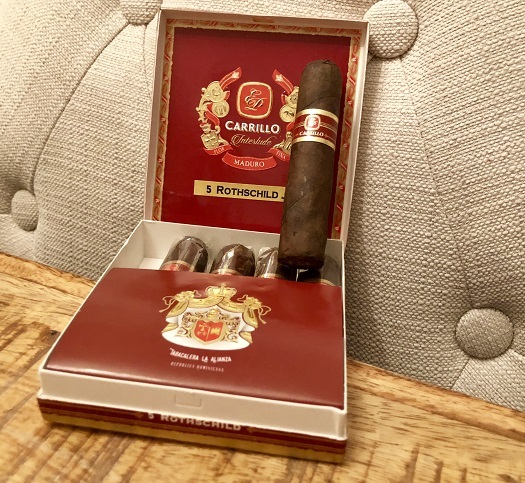 Carrillo Interlude Maduro Rothschild Jr. earns a solid rating of four stogies out of five. I love Ernie’s cigars, going back to the old El Credito LGCs. I will definitely try these, and thanks for the review.